Médecins Sans Frontières (MSF) is providing free health care to displaced people in the city of Bangui in the Central African Republic (CAR) who have been displaced due to political violence. Renewed outbreaks of inter-communal violence since September is keeping the population on edge, with many fearing a flare-up of tension at any moment. The worsening security situation has also crushed hopes for the 450,000 internally displaced people; and a similar number of refugees who have fled to neighbouring countries, of returning home anytime soon. General view of the a displaced persons camp in M'Poko, Bangui. To enable access to free quality health care for this vulnerable population, MSF is providing healthcare and running mobile clinics in five camps around Bangui. MSF also runs a hospital and a maternity clinic in Mpoko, and provides medical care once a week the central mosque in the Muslim enclave of PK5. Many people in the camps have witnessed shocking scenes of violence and have had their homes pillaged and looted. Lucienne, a woman in her forties, fled her home two years ago when four of her neighbours were killed during an outbreak of violence. Since then, she has been seeking safety in Mpoko together with her family. “Life is too difficult in the camp. It’s unsafe, dirty and the flies are everywhere” she says, as she helps her sick daughter make an appointment at the MSF hospital in the camp. People wait to be seen at an MSF hospital in a displaced person camp in Benzvi, Bangui. In the Benzvi camp, located in a part of Bangui which has seen relatively less violence, some 2000 people have sought refuge. Many of them have had to flee their homes with little or no belongings, and are sleeping in makeshift tents or out in the open. In order to have something to eat, many rely on small plots of land to grow crops. MSF comes to Benzvi twice a week to deliver medical care. On an average day, MSF sees around 150 patients, mostly seeking care for diseases such as malaria, respiratory infections and diarrhea – many of which are a result of the deplorable conditions in the camp. In order to ensure camp residents have access to safe drinking water, MSF runs in collaboration with partner organisations a water pumping and purifying station which delivers purified water to Benzvi and other camps in case of breakdown of the city water supply. 17 year old Mireil has her baby weighed by an MSF staff member at an MSF hospital at a displaced persons camp in Benzvi, Bangui. Ethna and Nadege have been living in Benzvi after their homes in the PK5 district were attacked by armed groups. They have been friends since years, and are both single mothers with several children to feed. Their children have fallen ill with malaria several times since they moved to Benzvi but have received free treatment from MSF’s mobile clinic. To survive, Ethna and Nadege bake cakes and sell them in the street: “We only have enough food for ourselves and our children for one meal a day” says Ethna. Nadège is the mother of three children, two daughters, Gabriella and Abigaille, and a boy born one month ago, named Prosper. Nadège gave birth in BenZvi camp helped by a traditional midwife. “During the day, many people return to the neighbourhood where they lived, but they are too afraid to stay there at night so they sleep here in the camps” says Reims Pali, who works as assistant field coordinator for MSF. Being of Central African Republic origin, he has witnessed the situation in the country descend further into lawless chaos during the last two years. "They live in tents built of waste tarpaulins that are full of holes. 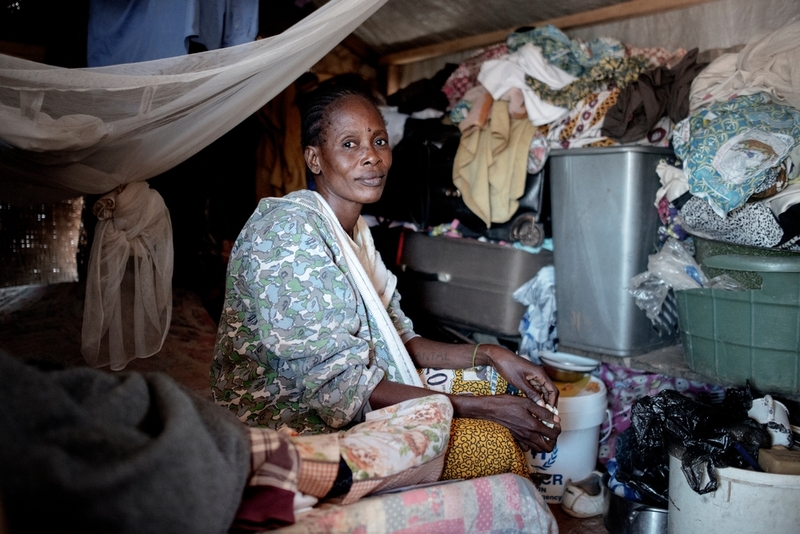 They sleep on mats on the ground and are exposed to mosquitoes which may carry malaria." "Unless the security situation gets better, they will have to stay here in these camps” he adds.